The Mission of Szajnbrum Law Offices is to provide high-quality professional legal services while balancing our focus on integrity, humanity, and the needs and desires of our clients. 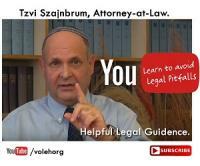 Headed by Tzvi Szajnbrum, Attorney-at-Law, the Szajnbrum Law Offices offers its clients its vast legal expertise in a wide variety of legal matters including litigation. Our lawyer practitioners get the job done and get it done well. Tzvi Szajnbrum, Director, was born in Rio de Janeiro, Brazil, in 1957 and made Aliya (immigrated) to Israel in 1977. He is a licensed attorney and professional mediator. Mr. Szajnbrum is also personally involved in the new immigrant community, giving “pro bono” guidance through the Voleh Organizationwhich serves as an advisor to new immigrants during their initial absorption phase, thus helping to guarantee a successful absorption into Israeli Society. Tzvi is only interested in figuring out the best solution. He's tough and someone you want on your side. Tzvi took the burden of a landlord problem completely off of our shoulders and did an outstanding job negotiating our contract with a new landlord that is fair to all parties.